Air Canada is investing $100,000 at the University of New Brunswick over the next 5 years to create a scholarship in honour of its former Chairman, President and CEO Claude Taylor (DCL ’80). Born in Salisbury, NB in 1925, Claude Taylor was a proud New Brunswicker. His career in the aviation industry spanned from 1949 to 1992, beginning as a passenger agent with TCA in Moncton. He was appointed president and CEO of Air Canada in 1976 and was also chairman of the board from 1984 until 1992. 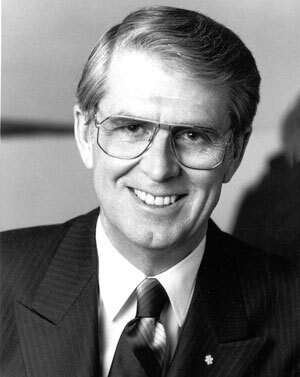 During his illustrious career at Air Canada, he made a significant contribution to the growth and development of the airline, spearheading the 1977 Air Canada Act, which saw the company become a stand-alone crown corporation and initiating Air Canada’s complete privatization in 1988. Air Canada is Canada's largest domestic and international airline serving more than 200 airports on six continents. Canada's flag carrier is among the 20 largest airlines in the world and in 2014 served more than 38 million customers. Air Canada provides scheduled passenger service directly to 63 airports in Canada, 52 in the United States and 86 in Europe, the Middle East, Africa, Asia, Australia, the Caribbean, Mexico, Central America and South America. Air Canada is a founding member of Star Alliance, the world's most comprehensive air transportation network serving 1,321 airports in 193 countries. Air Canada is the only international network carrier in North America to receive a Four-Star ranking according to independent U.K. research firm Skytrax. For more information, please visit: www.aircanada.com, follow @AirCanada on Twitter and join Air Canada on Facebook. Air Canada est le plus important transporteur aérien du Canada à proposer des services intérieurs et internationaux, pour plus de 200 aéroports répartis sur six continents. Le transporteur national du Canada compte parmi les 20 plus importantes sociétés aériennes à l’échelle mondiale et a accueilli plus de 38 millions de clients en 2014. Air Canada fournit des services passagers réguliers directs sur 63 aéroports au Canada, 52 aux États-Unis et 86 en Europe, au Moyen-Orient, en Afrique, en Asie, en Australie, dans les Antilles, au Mexique, en Amérique centrale et en Amérique du Sud. Air Canada est un membre fondateur du réseau Star AllianceMD, le plus vaste regroupement de transporteurs aériens du monde, qui dessert 1 321 aéroports dans 193 pays. Air Canada est le seul transporteur nord-américain d’envergure internationale auquel sont conférées quatre étoiles, selon la firme de recherche indépendante britannique Skytrax. Pour en savoir plus sur Air Canada, consultez le site aircanada.com, suivez @AirCanada dans Twitter et joignez-vous à Air Canada dans Facebook.